In next weekend's action, the Lions face the Reds in Brisbane, while the Rebels travel to Wellington to take on the unbeaten Hurricanes. Be sure to join us then for more interactive commentary! 80' - The Lions manage to do just that and they boot it out to end the game! Yay!!! !The Lions score!Mapoe you biscuit!That is great character boys! 78' - CONVERSION slotted by Jantjies. 76' - TRY to the Lions! 70' - The Rebels certainly made better use of their numerical advantage earlier in the game. 70' - It's 15 against 15 again now as Cummins returns from the sin-bin. 66' - PENALTY slotted by Harris. Can only imagine what Ackers told the boys at halftime, but it certainly worked! 60' - Jantjies slots the relatively easy PENALTY to level matters. 59' - The Lions win a kickable penalty after a dangerous tackle from replacement Rebels forward, Steven Cummins, who is also sent to the SIN BIN! 56' - Mike Harris pounced on a dropped ball in the Lions backline, but it's NO TRY. Terrible officiating,Lions just got robbed by Mr Ref! 49' - That was clearly a deliberate knock down after De Klerk attempted to pass. It should have been a Lions penalty, and yellow card if the referee was being consistent. 48' - However, replays show that the ball was knocked from De Klerk's grasp. Unlucky for the Lions! 45' - CONVERSION by Jantjies. 44' - Marnitz Boshoff scores under the posts. It comes completely against the run of play after the Lions turned over possession inside their own half. A brilliant break down the right wing from Sampie Mastriet, before he put Boshoff away. 43' - TRY to the Lions! Hard to gauge if the changes are working. We don't have any ball so how do you judge? Lions still not out of this, much better 2nd needed. Breyton Paulse, in his half-time analysis on SuperSport, says it was "plain silly" from Franco Mostert to concede the early yellow card and that it immediately put the Lions on the back foot. The Lions take the ball through the phases with their forwards and when they hear the full-time hooter, the ball goes out to Boshoff who boots it into the crowd! That's a brilliant win for the visitors, who have won their second match out of three on their overseas tour now. The Rebels will be kicking themselves but they have only themselves to blame as they failed to take their chances. CONVERSION, LIONS, JANTJIES. 16-20. Jantjies holds his nerve and lands the two-pointer which extends the visitors' lead! TRY, LIONS, MAPOE! 16-18. The Lions are on the attack just outside the Rebels' 22, after Mostert breaks up the middle! The ball goes out wide and Lionel Mapoe sells the defence a dummy before crossing over! Harris gets another chance to put more daylight between his side and the visitors after another Fourie infringement at a ruck but the kick is to the left of the uprights! The Rebels take the ball through the phases with their forwards, close to the Lions' 22, but make little headway as the visitors' defenders come up in a straight line and have little problem in keeping the home side in check. Stirzaker attacks around the blindside, close to the halfway line and throws a pass which puts Naivalu in the clear. He is soon confronted by a defender and kicks ahead but his effort is over-cooked and Skosan dots down behind his try-line. Colby Fainga?a is pinged for side-entry at a ruck just inside the Lions' half. Boshoff lines up a shot at goal but it's a shocker, which goes in the direction of the corner flag and falls about 15 metres short of the target! Wasted opportunity. PENALTY, MELBOURNE REBELS, HARRIS! 16-13. Harris gives the hosts a three-point lead after Corne Fourie infringes at a ruck. Higginbotham picks up and goes from a ruck inside the Lions' half but is called up when Paul Alo-Emile is pinged for obstruction. Jantjies kicks for touch and puts the ball out on the Rebels' 10-metre line. PENALTY, LIONS, JANTJIES! 13-13. Jantjies draws the visitors level, from the kicking tee, after Steve Cummins is pinged for a tip tackle on Whiteley! The Lions are giving their all as they try to take the lead. Whiteley, Maopoe and Mostert all handle the ball as they take the ball from inside their half into the Lions' 22. The Rebels attack close to the Lions' try-line and Harris goes over under a mass of bodies! The referee checks with the TMO who rules that the Rebels' pivot lost control of the ball as he went over the line. The Rebels attack deep inside the Lions' 22 and Harris throws a long pass to Naivalu, who is bundled into touch close to the corner flag by Mastriet! The Lions have stepped up a gear and had the better of the exchanges in the second half. They take the ball through several phases and go out wide where Mastriet takes a big hit from Sefanaia Naivalu! It's all Lions at the moment! They rumble it up with their forwards before going out wide and Jantjies throws an iside pass to Lionel Mapoe, who loses possession as he goes over the line after a tackle from Tamati Ellison! The Lions attack deep inside the Rebels' half and Warren Whiteley, Skosan and Faf de Klerk combine brilliantly! De Klerk tries to offload to Derick Minnie but the ball is knocked down by Placid deep inside the home side's 22. CONVERSION, LIONS, JANTJIES. 13-10. Jantjies adds the extras to narrow the gap to three points. TRY, LIONS, BOSHOFF! 13-8. Sampie Mastriet finds the ball in space just inside his half and beats a defender with a deft side-step! He is soon inside the Rebels' 22 and offloads to Boshoff, who steps inside a defender before scoring under the posts! The Rebels take the ball through several phases and Sean McMahon and Laurie Weekes are prominent ball carriers. They make little, headway, however as they are met by a wall of red defenders. Boshoff gets the second half started with depp kick which Harris gathers inside his 22. He kicks upfield and puts the ball out on the Lions' 10-metre line. The Lions take the ball through several phases with their forwards. Mostert, Armand van der Merwe and Ruan Dreyer all carry with great intent until Dreyer knocks on after a tackle from Stirzaker inside the Rebels' 22. From the resulting scrum, the Lions are blown up for an early shove and Harris boots the ball into touch. The Rebels hold a deserved lead after a superb start. The Lions have fought back well but will have to up the ante after the break if they want to win this game. The Lions are awarded a tap penalty after the Rebels are pinged for an early shove at a scrum. Jantjies puts the ball into touch on the hosts' 10-metre line. The Rebels attack and are soon inside the Lions' 22 with Scott Higginbotham a prominent ball carrier. They lose possession, however, when Toby Smith is held up after a solid hit from Ruan Dreyer. PENALTY, LIONS, JANTJIES. 13-3. Jantjies opens the Lions' account, from the kicking tee, after Pat Leafa and Harris are penalised for illegal play at a ruck. Boshoff tries to clear his line with a kick for touch but his effort is charged down by Stirzaker and, luckily for the Lions, the ball rolls over the dead-ball line. Luke Jones is penalised for side-entry at a ruck. Elton Jantjies kicks for touch and puts the ball out on the Rebels' 10-metre line. Toby Smith is pinged for illegal scrummaging. Boshoff kicks for touch and puts the ball out close to his 10-metre line. Tamai Ellison makes a break form inside his half and throws a pass to Stirzaker who is brought to ground inside the Lions' 22 after a tackle from Warwick Tecklenburg. The ball goes out wide and Pat Leafa crosses the whitewash but the try is disallowed after the TMO rules that Stirzaker knocked the ball on when he went to ground. Placid gathers a kick midway between the halfway line and his 22 and sets off on an attacking run. He makes little headway, however, as he goes down after a big hit from Armand van der Merwe. Dom Shipperley finds the ball in space down the right-hand touchline and kicks ahead! Skosan gathers and is forced into touch deep inside his 22! TRY, MELBOURNE REBELS, PLACID! 13-0. The Rebels attack deep inside the visitors' 22 and Timani throws a long pass to the debutant Jonah Placid, who scores in the right-hand corner! Harris misses with the conversion attempt. The Lions take the ball through a couple of phases just outside their 22 until Marnitz Boshoff launches a chip kick which Skosan gathers just inside the Rebels' half where he is brought to ground by Jonah Placid. TRY, MELBOURNE REBELS, INMAN! 8-0. The Rebels attack from a line-out inside the Lions'' 22 and Pat Leafa and Lopeti Timani both go close from pick up and goes before Mitch Inman crashes over after running onto a pass from Stirzaker! Harris'' conversion attempt strikes the upright. YELLOW CARD, LIONS, MOSTERT! Franco Mostert is sent to the sin bin for a cynical challenge on Nic Stizaker from an offside position at a ruck. PENALTY, MELBOURNE REBELS, HARRIS. 3-0. Harris opens the home side's account, with a well-struck three-pointer, after the Lions are pinged for offside play on defence. Mikee Harris gets us underway! His kick is a deep one and Courtnall Skosan gathers inside his 22 before hitting the deck. Good day and welcome to our live coverage of this Super Rugby hit out between the Rebels and Lions from AAMI Park in Melbourne. Don't go away! We'll return shortly with team news. Rebels' head coach Tony McGahan made just one enforced change to his side. Australian U20s full-back Jonah Placid, who made one Super Rugby appearance before moving to Melbourne will make his Rebels debut in the number 15 jersey. Rebels recruits Mike Harris and Dom Shipperley will each make their 50th Super Rugby appearance this week and Harris lines up at fly-half as Jack Debreczeni, who sustained a knee injury earlier in the week. 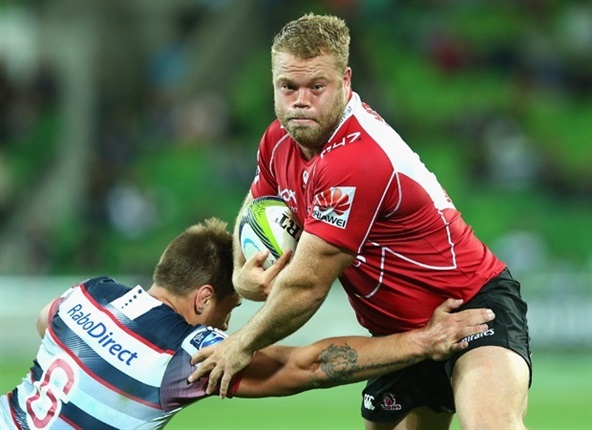 Lions coach Johan Ackermann has made several changes to his starting XV. In the backline, Elton Jantjies shifts to inside centre to make way for Marnitz Boshoff at fly-half while Faf de Klerk will start at scrum-half. Courtnall Skosan fills the left wing berth, which means Sampie Mastriet moves to the right wing while Jaco van der Walt will start at fullback. Meanwhile, in the forwards, Schalk van der Merwe, Armand van der Merwe and Ruan Dreyer will make up the front row. Robert Kruger will start at lock, while Derick Minnie has also been promoted to the starting line-up at flank.